At CeBIT 2009, Fraunhofer Institute for Integrated Circuits IIS will present the Fraunhofer Audio Communication Engine. Providing a complete audio solution of exceptional quality for communication applications, the technology will be demonstrated via a temporary installation (Hall 13, Booth B24) that illustrates the ways in which new generation telepresence systems have the potential to revolutionize social gatherings over long distances. The result of many months of research and development, the Fraunhofer Audio Communication Engine has been designed to offer significant improvements to the overall sound quality of teleconferencing or VoIP applications when compared to existing systems. First-class audio clarity, seamless phone and conference calls, and meetings over the Internet that feel every bit as natural as a face-to-face conversation in the same room are among the many benefits of Fraunhofer's latest innovation. The defining component of the Fraunhofer Audio Communication Engine is the MPEG audio codec "Enhanced Low Delay AAC", which guarantees hi-fi sound quality at low data rates and low coding delays. An echo control eliminates acoustical echo commonly generated in hands-free communication, while an intelligent analysis and playback of the sound-field over several loudspeakers ensures that it is always possible to identify the position of each participant in the virtual room - even if several people are talking at the same time. Error concealment and conversion to the network transmission capacity guarantee fluent conversations without interruption, including over low-bandwidth connections. At CeBIT 2009, Fraunhofer IIS will demonstrate the Fraunhofer Audio Communication Engine via a temporary telepresence installation. This will take the form of two separate but connected living rooms, and will illustrate the ease with which friends and family can take part in games and conversation - no matter how far apart they may be. 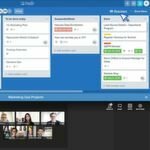 The telepresence configuration to be shown at CeBIT is part of the EU project "Together Anywhere, Together Anytime" (TA2), which explores the ways in which technology can support group-to-group communication. Further information on the TA2 project can be found at www.ta2-project.eu; for information on the Fraunhofer Audio Communication Engine, please visit www.iis.fraunhofer.de/amm. Founded in 1985 the Fraunhofer Institute for Integrated Circuits IIS in Erlangen, today with 585 staff members, ranks first among the Fraunhofer Institutes concerning headcount and revenues. As the inventor of mp3 and co-inventor of the MPEG 4 AAC audio coding standard, Fraunhofer IIS has reached worldwide recognition. It provides research services on contract basis and technology licensing.The research topics are: Audio and video source coding, multimedia realtime systems, digital radio broadcasting and digital cinema systems, integrated circuits and sensor systems, design automation, wireless, wired and optical networks, localization and navigation, imaging systems and nanofocus X-ray technology, high-speed cameras, medical sensor solutions and communications technology in transport and logistics.